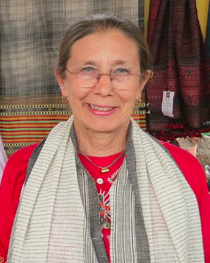 Judy Frater is Founder Director of Somaiya Kala Vidya, an institute of education for artisans. She was born in the United States and holds Master’s degrees from the University of Washington and the University of Minnesota. Frater first visited India as a college student in the 1970s, studying alongside a goldsmith in Pune. Here she learnt as much about the philosophy and culture of the area as she did metal craft, discovering the tribal embroidery styles of Kutch and Saurashtra, which became the focus of her work. In 1981, Frater completed her postgraduate course in South Asian studies at the University of Minnesota, and using all her savings returned to India in 1983 to spend a year with the Rabaris of Gujarat and Rajasthan. Following her excursion, Frater began a postgraduate course in Museology at the University of Washington, which she completed in 1987, before becoming Assistant and then Associate Curator of Eastern Hemisphere Collections at the Textile Museum in Washington D.C. a position she held between 1989 and 1992. During her time at the museum, Frater rewrote her master's degree thesis into a book on Rabari textiles entitled Threads of Identity, which though not published until 1995 later won the Costume Society of America’s annual Milia Davenport Award in 1997. Wishing to do something to preserve traditional Indian craft rather than just study it, in 1993 Judy Frater, together with local embroiders, founded the Kala Raksha Trust. The first design school run largely by local artisan communities, Kala Raksha is an extraordinary non-governmental organisation, situated in the deserts of Kutch in Western Gujarat. An educational institution open to all working artisans of the area, Kala Raksha provides design education gauged to move those who produce centuries old traditional crafts from artisans merely fulfilling orders to designers who influence the market. The school is also dedicated to providing new knowledge and skills, which can be directly applied to the artisan's own art as well as encouraging innovation to make their products appropriate for contemporary markets. While it could be argued that many institutions share such aims, at Kala Raksha Ms Frater has developed a curriculum, resources and a teaching program to respond to the rhythm of life of the students. Lives which must revolve around home and family commitments, combined with seasonal agricultural work and all within a society bound by ritual and custom. She has lived in Kutch, working with artisans, for 25 years. Alongside the Kala Raksha Trust, she established the Kala Raksha Textile Museum, and founded Kala Raksha Vidhyalaya, the first design school for traditional artisans. For this concept, Ms Frater was awarded an Ashoka Fellowship for social entrepreneurship in 2003. Under her eight-year tenure as Director, Kala Raksha Vidhyalaya received international recognition for its unique and successful approach to education of artisans. She received the Crafts Council of India Kamla Award in 2010, and the George B. Walter ’36 Service to Society Award from Lawrence University in 2014. In 2014 Judy Frater joined Somaiya group to found Somaiya Kala Vidya, to take design for artisans from a program to an institute and reach its full potential.